We’d love your help. Let us know what’s wrong with this preview of Running Like China by Sophie Hardcastle. Most of the time we don't notice the darkness... not until we're in the thick of it. It was like that for Sophie Hardcastle, as the joy she'd always known disappeared. She was constantly tired, with no energy, no motivation and no sense of enjoyment for anything. Her hours became empty. And then, the month before she turned seventeen, that emptiness filled with an intense, Most of the time we don't notice the darkness... not until we're in the thick of it. It was like that for Sophie Hardcastle, as the joy she'd always known disappeared. She was constantly tired, with no energy, no motivation and no sense of enjoyment for anything. Her hours became empty. And then, the month before she turned seventeen, that emptiness filled with an intense, unbearable sadness that made her scream and tear her skin. To ask other readers questions about Running Like China, please sign up. This was a beautifully written memoir that was so brutally honest about Sophie's struggles with Bipolar. It was very insightful and moving, bringing me to tears on more than one occasion. Stories like these are so important. For the people going through the same or similar situations, it lets them know that they are not alone, despite how lonely they feel. And for those that know someone dealing with mental illness, it sheds light on the difficulties that person may face, and helps them understa This was a beautifully written memoir that was so brutally honest about Sophie's struggles with Bipolar. It was very insightful and moving, bringing me to tears on more than one occasion. Stories like these are so important. For the people going through the same or similar situations, it lets them know that they are not alone, despite how lonely they feel. And for those that know someone dealing with mental illness, it sheds light on the difficulties that person may face, and helps them understand and empathise. I'm always drawn to memoirs of people that have experienced a mental illness, as each person has such a unique story to tell. Sophie Hardcastle tells her story of life with Bipolar. I really appreciated her brutal honesty and so much of her story really resonated with me. Her memoir documents her teenage to young adult years with the illness and her initial denial, anger, and eventually acceptance and what she can accomplish in spite of the illness. Sophie has a lovely way with words and some of I'm always drawn to memoirs of people that have experienced a mental illness, as each person has such a unique story to tell. Sophie Hardcastle tells her story of life with Bipolar. I really appreciated her brutal honesty and so much of her story really resonated with me. Her memoir documents her teenage to young adult years with the illness and her initial denial, anger, and eventually acceptance and what she can accomplish in spite of the illness. Sophie has a lovely way with words and some of the ways she described people I found interesting (for example the boy with a glacier melting in his eyes). The only thing that bothered me with the way her memoir was written was the jumping back and forth between times in her life, sometimes it felt a little bit confusing. However, I really loved this book and love that more and more people are telling their stories and experiences with a mental illness. Running Like China is a memoir of a young woman in Australia, that held my attention all the way through. Her book is a gift of herself - her story to each and every reader. Her hope is that it will help others who are experiencing the depths of mental illness that may lead to suicide. That it will encourage them to hang in there in the down times and to remember all there is to live for. It is a very moving, articulate, insightful piece of writing and it gave me some understanding of what it ca Running Like China is a memoir of a young woman in Australia, that held my attention all the way through. Her book is a gift of herself - her story to each and every reader. Her hope is that it will help others who are experiencing the depths of mental illness that may lead to suicide. That it will encourage them to hang in there in the down times and to remember all there is to live for. I loved how she shared about those who were there for her, her family, a few close friends, a boy with ice blue eyes, a school counsellor, a white bearded psychiatrist. And for some reason a surf maker -"the coffee -coloured, coffee scented man with shorts as short as the seventies", who helped her back to the enjoyment of something important to her. I was saddened by the misdiagnosis to begin with that I think caused much suffering in the beginning. Drugs that weren't helping and had terrible side-effects. Of course bi polar is a chemical imbalance and when the right drugs are used and the person can underscore that with responsible living then drugs are another support for the person. I feel inadequate in responding to this book. It is powerful, it is important reading. Read it. It's one I know I will pick up again and reread. Ok so I am biased and should not be rating or reviewing Running Like China really because it's all about our family, my daughter and four years of very difficult times. However I do love this book. When Sophie first told me she was writing a memoir I braced myself for the expose of all the ugly and horrible details. The dismembering of everyone and everything around us. When I picked up her first manuscript, I read it in one sitting and went through two boxes of tissues in the process. When I fi Ok so I am biased and should not be rating or reviewing Running Like China really because it's all about our family, my daughter and four years of very difficult times. However I do love this book. When Sophie first told me she was writing a memoir I braced myself for the expose of all the ugly and horrible details. The dismembering of everyone and everything around us. When I picked up her first manuscript, I read it in one sitting and went through two boxes of tissues in the process. When I finished it, I was emotionally drained, but strangely uplifted. I loved her beautiful prose which was almost poetic in describing the harrowing journey we had found ourselves on. Her descriptions of the people, not naming names or pointing fingers, just telling it like it was. It was truthful and honest. It's interesting because these were the two sentiments we tried hardest to hold onto while living in the maelstrom of her illness. They shine through the darkness of the story and give light and insight where before there was none. I am very proud that Sophie was able to share her story and it has been so well received. I know it helps people suffering from mental illness, supporting those with mental health issues and working with people who are affected by depression, anxiety and all of the facets of the mental illness in its many forms. I wish this book was around when she was in hospital, because then there were few words, no colour in her art and no writing that had her voice. She was disconnected from everyone and everything that she loved. I desperately wanted to understand what she was thinking and Running Like China is just that. I am so looking forward to reading the novels she produces. Her unique voice, ability to write beautiful prose while weaving characters and storylines together is truly a gift. Breathing underwater, her first novel, published this year, is testament to this. I love that book too but don't start me! THIS BOOK HAS SERIOUSLY SAVED MY LIFE. I originally found out about running like China through Sjana Earp, and I couldn't wait to read it after she semi reviewed it. This book follows Sophie Hardcastle's battle with bipolar disorder. Her journey through thick dark clouds and blissful moments of sunshine is incredibly inspirational. I have read this book about 3 times and it has honestly changed my life. Sophie has become my biggest inspiration, her beautiful words and creative imagery is what ma THIS BOOK HAS SERIOUSLY SAVED MY LIFE. I originally found out about running like China through Sjana Earp, and I couldn't wait to read it after she semi reviewed it. This book follows Sophie Hardcastle's battle with bipolar disorder. Her journey through thick dark clouds and blissful moments of sunshine is incredibly inspirational. I have read this book about 3 times and it has honestly changed my life. Sophie has become my biggest inspiration, her beautiful words and creative imagery is what makes this book more then the rest. Sophie Hardcastle truly is a gifted writer, from the way she looks at the world to the way the words flow across the pages. This book was as beautiful as it was heartbreaking and written with such intense honesty. An eye and heart opening account of mental illness. I highly recommend this as a must read. Such a beautifully written memoir. Although Sophie discusses very dark times in her life, the book is written with hope and encouragement to anyone struggling with mental illness. Sophie's writing is descriptive and poetic, and her pain is translated across the page. Sometimes hard to read but worth it, I devoured this in a few hours and would recomend to anyone struggling with or impacted by mental health issues. Books are such powerful things: within those pages contain words that form sentences that become paragraphs that tell a story, a story perhaps bold, perhaps devastating, perhaps inspiring, perhaps uplifting.... Few books have I come across that are all these things, and more. Running Like China is a true story. In its quiet and meditative prose, the slowly simmering desire within me glows slightly brighter. One day I will write something, as many readers one day aspire for. I think it is a massive feat, inspiration at its greatest, to think that a nineteen year old "true blue" Aussie, whose story begins and lives on in the sea, has managed to write something so personal, deep, touching, true and just completely perfect. My only real experience with mental health has been as a nursing student on two two week placement blocks, certainly eye opening, confronting. The second placement was the more emotionally draining of the two, because I was working with teenagers whose lives lay before them like a deck of cards haphazardly placed, in no particular discernible order. They were broken, they were beautiful, they were girls and boys with futures hazy and unknown and so I worried for them, far more than one should have. My voice may have shaken on more than one occasion. I will never forget some of them, and even now I wonder what they are doing now. Since then I have held great respect for people who have to deal with mental illness, including the person, his/her family and loved ones and the health professionals who try their hardest to fix them. I probably would never picked this book up had I not attended the Hachette YA Book Blogger night and had she not agreed to speak in front of all of us that night. I walked in on that night convinced and determined not to walk out with any new books but I failed miserably. I could tell she was a beautiful person of strength, grace, intellect and humour, right from the first word that left her mouth, the first hesitant smile that formed on her lips. She had this air of ease with a burning intensity that flowed underneath, and I knew I could not leave without buying her book. I feel like I am rambling. I guess I just want to write, and so I am letting my fingers write before my mind has even allowed itself time to process what is being said. I have no doubt in my mind that this book will help. In its pages it holds immense power. Running Like China is perhaps the kind of book that one day I hope to write, one that is deeply personal and full of insight and truths. (Every person has a story.) Her writing was easy to soak in, despite the heavy subject matter. I cannot wait to read more from her!! I found this memoir quite moving and it succeeded in changing my thinking about a few things, including (not in any particular order): how families relate, what writing means when you commit to it early as opposed to later in adulthood, sisterly relationships, the implications of social media for teenagers growing up with mental illness (am non-existent when I was a teen), what fighting for someone you love can look like, how good some young-adult men are to the people around them (truly, they o I found this memoir quite moving and it succeeded in changing my thinking about a few things, including (not in any particular order): how families relate, what writing means when you commit to it early as opposed to later in adulthood, sisterly relationships, the implications of social media for teenagers growing up with mental illness (am non-existent when I was a teen), what fighting for someone you love can look like, how good some young-adult men are to the people around them (truly, they often get a bad rap but there're lots of good ones out there), surfing and my relationship to the ocean, running, how breaking with reality happens, how easy it is to be misdirected by an ill person when they want you to be, how hard it is for them to communicate the help they need, memoir structure. It's written in a kind of spiral formation in terms of topic, moving through main illness-plot events chronologically in broad terms but sometimes covering a certain period again in a later chapter, but from another perspective, because the work unfolds more theme by theme (e.g. The ocean) than event by event. Often this irks me when I'm editing but here it works (possibly because editor Julia Stiles helped make it work). The writing is strongly evocative too, and grows from motifs and metaphor. There's a little repetition but I completely forgave that because it does happen, and she was nineteen or twenty when Hardcastle wrote this. I will read her novel, which I think is coming soon. Note: I 'read' the Bolinda Audio version of this book. I thought the author herself may have done a better version, because in person* she's more down-to-earth than the reader's kind of put-on now-I'm-reading-to-you voice suggested. She did give the characters distinct voices (but then so did Hardcastle's dialogue). Wow! This is an important and beautifully written memoir about one young woman's experience with mental illness. Not another self help book about 'how I got myself over mental illness' but rather Hardcastle chronicles the process of understanding, of coming to terms with, and of accepting mental illness as a part of her make up, to ultimately take responsibility for what she could control to help stabilise her health and not for what she couldn't control. Written with insight and honesty, Haardcas Wow! This is an important and beautifully written memoir about one young woman's experience with mental illness. Written with insight and honesty, Haardcastle breaks the silence of mental illness and lays herself bare for us to understand. It is artistically and beautifully written. A book to give hope to those suffering from mental illness and a book to help others understand - I can't recommend it highly enough. This is a moving memoir of what it is like to live with a mental illness and how there is beauty in everything, if you know where to look. Sophie Hardcastle was finally diagnosed with bipolar in her late teens, after several hospital admissions and testing her family to their limits. Her journey is beautifully written - one of the best descriptions of depression and manic episodes that I've come across. And while this is a pretty grim topic to read about, her story always contains hope. The way she describes that feeling of overwhelming darkness for no good reason at the drop of a hat is so close to home, we all have those moments however living day in and day out with a mental illness is hard, Sophie isn't the type to ask for sympathy though, not once while reading this book did I feel that she got sappy or seemed to want sympathy, she just tells her story (letter) and hopes that it will help others seek help and potentially tell their story. I'm meeting Sophie this weekend at Dymocks Sydney as she is attending the YA book meet to speak about her other book, Breathing Underwater, I can't wait to tell her just how her book made me feel and say thank you for the bravery of putting her personal lows out there for others to read and appreciate... Bravo Sophie! Running Like China is a stunning memoir of Sophie Hardcastle's fight with bi-polar. It starts for her at 16, and as it begins, she has no idea what is happening to her. Nothing feels good, darkness is rolling in, and it feels like her skin in shrinking. She doesn't know how to explain it to others because she doesn't know how to explain it to herself. Depression takes hold and Sophie uses drugs, alcohol and self-harm to make herself feel better. Sophie has opened herself right up and laid hersel Running Like China is a stunning memoir of Sophie Hardcastle's fight with bi-polar. It starts for her at 16, and as it begins, she has no idea what is happening to her. Nothing feels good, darkness is rolling in, and it feels like her skin in shrinking. She doesn't know how to explain it to others because she doesn't know how to explain it to herself. Depression takes hold and Sophie uses drugs, alcohol and self-harm to make herself feel better. Sophie has opened herself right up and laid herself bare in this captivating recount. She doesn't shy away from the ugliness of her illness, wanting to help others in the same situation, and to also help the families of those going through the same thing. Mental illness is a disease, yet because it is a disease of the mind, it's hard for people to see it for what it really is. As someone who struggles with anxiety, there were parts of this book I could really relate to - I know what it's like to feel like your skin is shrinking, like you don't fit in it. I also have family members who struggle with mental illness, and it was nice to see an inside view of what they could be going through. This is a book that needs to be read, and not only by those going through something similar, or have family members going through something similar. Mental Illness affects so many of us, and we need to break the stigma attached to it and we should all do what we can to try and better understand it. 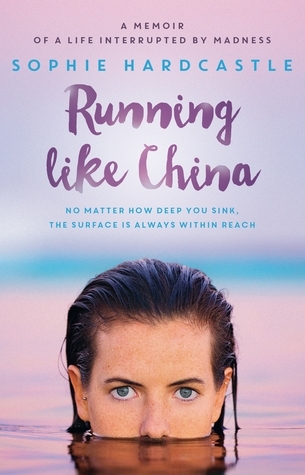 Running Like China is about a teenaged girl who loves surfing and writing about equally before she is suddenly struck down by some kind of mental health disorder that scraps two years out of her young life. This is her memoir where she tells all in the hope of actually giving hope to other people similarly afflicted. As someone who is ten years older than her, I still found this memoir incredibly accessible and honest, very well written. I found myself in a bit of a trap of staying up and reading Running Like China is about a teenaged girl who loves surfing and writing about equally before she is suddenly struck down by some kind of mental health disorder that scraps two years out of her young life. This is her memoir where she tells all in the hope of actually giving hope to other people similarly afflicted. As someone who is ten years older than her, I still found this memoir incredibly accessible and honest, very well written. I found myself in a bit of a trap of staying up and reading it up till the point where I could say that she was actually okay because I didn't want to put the book down halfway through one of the passages. A confronting and distressing story that is told with a poise that makes the writing so readable and remarkable for such a young writer. Brilliant awareness raising of mental health issues and such a raw and honest account of her battle, one I will always remember. An in depth insight into what it means to be struck down by mental illness during adolescence on the shores of Sydney's Northern Beaches. Sophie Hardcastle's memoir gives hope to those who may, or who have already struggled in life in this way. Honest and raw, but overall the writing was not to my taste as she repetitively used particular metaphors and phrases. 3.5 stars rounded down to 3. In terms of a similar read, I much preferred Madness: A Bipolar Life by Marya Hornbacher. A book I have read and fallen in love with before and was able to do all over again. Sophie has not just simply put pen to paper but she has created art with her words. The book is so beautifully written and is an incredible insight into a life lived and fought for. Oh my. I am glad I read this. A frank yet surprisingly poetic account of bipolar disorder/depression/self harm in a teen. Very sad, but also a good read. This memoir was so beautifully written and raw. Sophie writes about the highs and lows of battling mental illness. I found myself relating to her own thoughts and feelings on some of the things she was experiencing daily. Sophie's story is a potent and valuable one that offers insight into what it's like living with a mental illness, specifically as a young, apparently middle-class Australian woman with Bipolar. As someone who also experiences mental illness, it was comforting to read another's story and know that I was not alone. I hadn't really heard anyone else's struggle in such detail before and so despite the fact that her story was at times heartbreaking, it was also really encouraging. Sophie carries some Sophie's story is a potent and valuable one that offers insight into what it's like living with a mental illness, specifically as a young, apparently middle-class Australian woman with Bipolar. As someone who also experiences mental illness, it was comforting to read another's story and know that I was not alone. I hadn't really heard anyone else's struggle in such detail before and so despite the fact that her story was at times heartbreaking, it was also really encouraging. Sophie carries some good advice and wisdom. I like what she said about how witnessing someone with a mental illness can alert others to their own psychological vulnerabilities; hence why many people feel uncomfortable around the topic. It's a reminder that none of us are perfect nor safe from the possibility of mental illness, yet there is always hope. As she says, we can adapt and we can improve. Sophie Hardcastle could have hidden away from the world, within the safe, warm embrace of her family. Taken refuge within the comforting presence of the boy with the icy blue eyes. She did not have to leave at all. But, no, Sophie Hardcastle wrote a book. She opened up her life and generously shared it with the world. Why? So that the silence can be shattered - the taboos around mental illness can be smashed. And, most importantly, to give hope to anyone struggling to find their way through. Tha Sophie Hardcastle could have hidden away from the world, within the safe, warm embrace of her family. Taken refuge within the comforting presence of the boy with the icy blue eyes. She did not have to leave at all. Why? So that the silence can be shattered - the taboos around mental illness can be smashed. And, most importantly, to give hope to anyone struggling to find their way through. That no matter how deep you have sunk, the surface is always within reach. Good on you, Sophie, I take my hat off to you. Although this book talks about depression , it's about more then that alone , it's not all depressing , it's encouraging and full of hope , as someone who doesn't suffer from depression this book helped me understand what depression can really do to someone. But it also made me so great full for what I have . Running like China is written in a really understandable and engaging manner that pulls you in, in the best possible way . If your going through a hard time .. Read this book it will show y Although this book talks about depression , it's about more then that alone , it's not all depressing , it's encouraging and full of hope , as someone who doesn't suffer from depression this book helped me understand what depression can really do to someone. But it also made me so great full for what I have . Running like China is written in a really understandable and engaging manner that pulls you in, in the best possible way . If your going through a hard time .. Read this book it will show you that you can come out the other hand and also gives you some great advice . If you want to understand mental illness .. Pick this book up . Sophie Hardcastle is a twenty-two year old author and artist currently living and creating on the Northern Beaches in Sydney, Australia. Sophie is studying a Bachelor of Fine Arts at Sydney College of the Arts. She is majoring in painting. Sophie's memoir Running like China is published by Hachette and was released in September 2015. Hachette will publish her debut novel, Breathing Under Water on th Sophie Hardcastle is a twenty-two year old author and artist currently living and creating on the Northern Beaches in Sydney, Australia. Sophie's memoir Running like China is published by Hachette and was released in September 2015. Hachette will publish her debut novel, Breathing Under Water on the 12th of July, 2016. In addition to her books, Sophie has written for various magazine publications, including ELLE, Harper’s Bazaar and Surfing World and has also written for theatre.